There are not many things that can warm you up quickly like a bowl of hot streaming soup. It's my favourite choice when it comes to the colder months and ever since starting slimming world I am always thinking of new ways to get more fruit and vegetables into my diet. Soup is the perfect way to do this and nothing beats a home made hearty soup that is jam packed full of veggies. 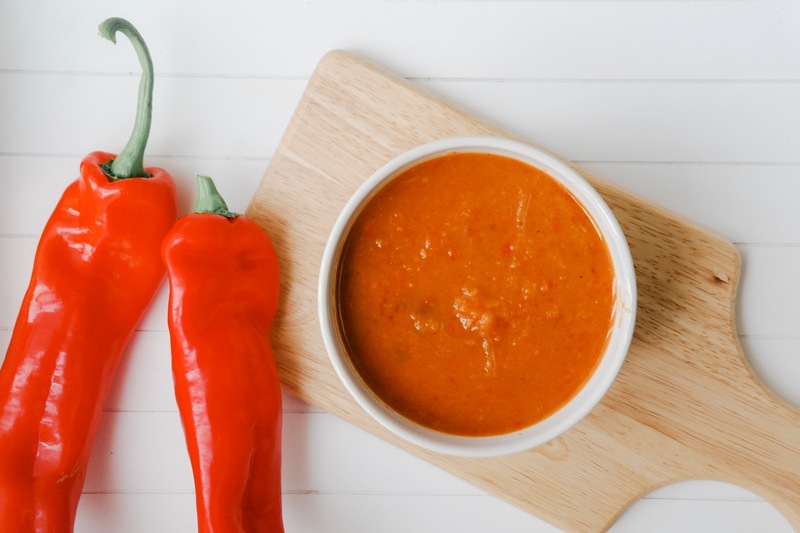 With this simple and easy recipe, red peppers, onions and sweet potato are paired with paprika and roasted in the oven to make such a sweet tasty soup. This soup recipe has become my favourite way to warm me up in the afternoons. The unique flavours are a match made in heaven as the combinations are blended together to make a super rich and healthy bowl of soup. What makes this even better is the fact that it's low calorie and completely syn free, great news for those on slimming world. This roasted red pepper and sweet potato soup has become one of my favourite ways of making a quick and tasty soup, perfect when you want something that can be prepared with the minimum of fuss. Roasting the peppers and sweet potatoes really intensfies the flavours in the recipe. You start off the soup by chopping the red peppers, sweet potatoes and red onion and placing them onto a baking parchment. Spray one calorie spray and add salt, pepper and paprika over the veggies and pop them into a preheated oven at 180°c for 15-20 minutes. At this point, it's time to make up your stock. Then add all your roasted veggies into a saucepan along with the stock, a little more paprika and use a hand blender to combine the ingredients together. Now all depending on your preference you can blend to a smooth texture or leave the veggies making a lovely chunky soup. Adjust the seasoning to your own tastes and then serve whilst warm and steamy. Or alternatively, double up on your ingredients and then put some into a container and pop in the freezer for another cold day. This roasted red pepper and sweet potato soup is my go to soup now. It's so simple and easy - you roast your veggies in the oven, blend them and out comes a super tasty soup to help warm you up on the colder days. It's jam packed full of flavour and goodness that you will want to make over and over again. If you like me? Why don't you pin me for later!